← Opportunity to provide feedback and share your opinions! 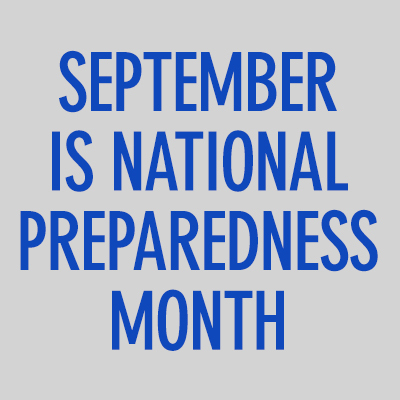 We are now beginning Week 3 of National Preparedness Month. It seems to be going fast! We joined the online preparedness community at the beginning of the month and have seen lots of useful information, resources and ideas put forward so far. The following, Be Disaster Aware: Pets & Animals, is especially worth highlighting here since our pets depend on us for the most basic of needs. We’ve attached it in .pdf format here (National Preparedness Month 2014 – pet preparedness ) and as a graphic below. Don’t miss the opportunity to view the Google Hangout hosted by the ASPCA on September 18th! This entry was posted in Announcements, Earthquake Preparedness and tagged National Preparedness Month, pet preparedness, preparedness steps, resources for pet owners. Bookmark the permalink.